Does your tot turn his nose up at fruit and vegies? You love your little to bits. He’s full of energy and growing into a happy, healthy and little child. There’s just one small snag – he pushes most fruit away, baulks at trying a carrot stick and dry retches at the mere thought of eating broccoli. If this is your child, you’re in good company. Heaps of parents and au pairs struggle to get their children to eat at least one serve of fruit or vegetables each day. Can we put this food group on hold and hope that one day the littlies will just grow into it like a comfy pair of shoes? Or do we batten down the hatches and prepare for the nightly battle, hoping to emerge triumphant having successfully force-fed all the four-years-old out there their daily greens? Neither options is going to be successful in the long term, so it’s time to put away the war paint and find some better solutions to this age-old battle between parent and child. All children need fruit and vegies every day as a part of the healthy diet. These foods provide essential fibre (‘roughage’) to keep your little one’s bowels and digestive system working. Constipation can lead to many long-term health issues and can affect your child’s appetite and lead to pain and irritability. A recent study has suggested half of all Australian children do not have adequate intakes of fibre and in a survey by The Gut Foundation, just under half of all mums said their children suffered bowel problem on a regular basis. Fruit and vegies are also the main sources of vitamins C, B1, and B2 for healthy growth, development and immune systems. Starchy vegetables such as potato, sweet potato and corn and fruits provide carbs for fuel, providing energy. The unrefined nature of fresh fruit provides instant vitamins and minerals as well as protective antioxidant. The edible skin is valuable too, as the vitamins are found just a few millimetres underneath. For many children, fear of an unknown food is a big hurdle. Often you’ll need to offer a new fruit or vegie several times (up to 10 or 15) before your child is comfortable with it. 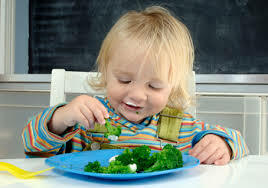 NIGHT 1: Place a small piece of the cooked vegetable or cut fruit on the plate with the rest of your child’s meal. Ask him to bring his lips (for little ones ask them to kiss it, older kids just press it to their lips). The lip area is very sensitive and this brings the food to the nose where your child can smell that it’s not offensive. NIGHT 2: Ask your tot to hold the vegetable or fruit on his back teeth. Here the tongue can pass over it for the first taste. NIGHT 3: Ask him to place the vegetable or fruit on his back teeth. At this point he may be willing to bite down and if so, praise him. This builds confidence that the food is okay and will not make him sick. If he doesn’t bite down, leave this to the next night. NIGHT 4: Get your child to chomp down on the vegetables or fruit down with or without a bridging flavour such as a sauce or yoghurt. Offer legumes such as baked beans or chickpeas blended to make hummus on crackers or pizza bases, or a spread. Grate veggies into main dishes such as chicken bites or meat balls. Use vegetable juice drink – you can buy poppers that contain one serve of fruit and veg. While these provide some vitamins and minerals, they do lack the fibre of fresh fruit and vegetables, trough. If fresh fruit won’t go down the hatch, try offering dried or semi-dried fruit as a snack. Ask to your au pair to make fruit puree and mix it into plain yoghurt or bake into muffins or scrolls. Use commercially available pouches containing pureed fruit and vegetables, looking for ones with no added sugar, preservatives or colours. Store-bought hot chips. They’re popular with kids and adults, but potato wedges and chips aren’t replacement for vegetables as they’re low in fibre and high in fat and salt. A healthier alternative is to make your own by leaving a part of the skin on the potato and baking or barbecuing. Store-bought fruit drinks. Fruit juices and drinks aren’t recommended for kids as they provide excessive amounts of sugar and kilojoules without the fibre or fresh fruit. A healthier alternative is to make your own by blending a serve of fresh fruit such as strawberries, mango or melon with ice to make a frappe. Fruit jellies, straps or tubes. These are essentially lollies containing small amount of fruit sugar a healthier alternative is to make your own jelly by adding dissolved gelatine to pureed fruit. Pour into fun moulds and leave to chill in the fridge. Hang in there! Most kids go through tricky eating patches, but with persistence you’ll eventually win him over. make to play a game with them later, not breaking a confidence, picking them up on time. At the same time, we extend our trust to them by expecting the best from them and believing in their fundamental goodness and potential. trust that no matter what he or she does, there is always the potential for positive change. up on your child, no matter what he or she does. you’re on their side. If most of what comes out of your mouth is correction or criticism, they won’t feel good about themselves, and they won’t feel like you’re their ally. You lose your only leverage with them, and they lose something every kid needs: to know they have an adult who thinks the world of them. Remember that respect must be mutual. like it when you talk to me that way.” A friend who was with us said, “If he’s starting this early, you’re going to have big problems when he’s a teenager!” In fact, rather than challenging my authority, my toddler was simply asking to be treated with the dignity he had come to expect. Now a teenager, he continues to treat himself, me, and others, respectfully. And he chooses peers who treat him respectfully. Isn’t that what we all want for our kids? Think of relationships as the slow accretion of daily interactions. You don’t have to do anything special to build a relationship with your child. The good — and bad — news is that every interaction creates the relationship. Grocery shopping, carpooling and bathtime matter as much as that big talk you have when there’s a problem. He doesn’t want to share his toy, or go to bed, or do his homework? his ideas about all relationships. That’s one reason it’s worth thinking through any recurring interactions that get on your nerves to see how you might handle them differently. criticizing are no basis for a relationship with someone you love. And besides, your life is too short for you to spend it in a state of annoyance. Do you listen when she prattles on interminably about her friends at preschool, even when you have more important things to think about? Then she’s more likely to tell you about her interactions with boys when she’s fourteen. Your teenager slams the door to her bedroom. Your ten year old huffs “Mom, you never understand!” Your four year old screams “I hate you, Daddy!” What’s the most important thing to remember? DON’T TAKE IT PERSONALLY! This isn’t primarily about you, it’s about them: their tangled up feelings, their difficulty controlling themselves, their immature ability to understand and express their emotions. Taking it personally wounds you, which means you do what we all do when hurt: either close off, or lash out, or both. Which just worsens a tough situation for all concerned. • try hard to remember what it feels like to be a kid who is upset and over-reacting. A full day of school can use up a lot of your child’s energy. Add in homework and extra-curricular or social activities, and your Au pair can see why adequate rest is important to keep those little bodies thriving. While each child is different, these guidelines can help you spot if your child’s sleep schedule is on track for her age. This chart includes naps. Just how important is sleep to your child’s ability to focus in school? 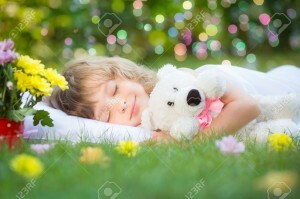 In a National Sleep Foundation experiment, children were asked to go to bed later than normal for a week, and then were asked to spend no fewer than 10 hours in bed for another week. During the week of later bedtimes, teachers rated these kids as having more academic problems and more attention problems. Finish homework and dinner with enough time for the family to unwind a bit before bedtime. Make sure your child’s room is relaxing and safe with no electronics or screens to distract him at night. Just as you baby-proofed when she was little, do some investigating to make sure her room isn’t a source of hidden toxins or allergens. Choose an organic mattress and wash sheets and bedding often with a natural laundry soap. Set a specific bedtime working backward from what hour your child must wake up to get to school on time (or the time you typically begin homeschooling) and allow for the age-appropriate number of hours your child needs to rest. Create a predictable bedtime routine. A younger child will need more guidance through his nightly routine, while an older child can begin practicing self-care. Want to be a great parent or a great Au pair? Want to raise a happy, healthy, well-behaved kid? 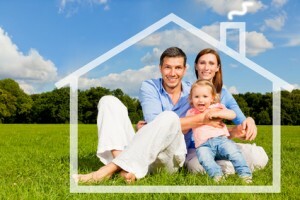 Want to live in a home where discipline becomes unnecessary? The secret is to create a closer connection with your child. It isn’t enough that we tell our children we love them. We need to put our love into action every day for them to feel it. And when we do that our kids need a lot less discipline! means paying thoughtful attention to what goes on between us, seeing things from our child’s point of view, and always remembering that this child who sometimes may drive us crazy is still that precious baby we welcomed into our arms with such hope. 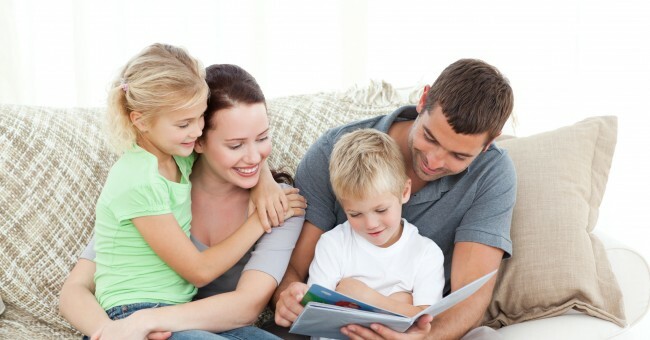 they had spent more time with their kids, however with the busy life most parents face, finding more time with our children is more difficult, having an Au pair in Australia to give you an extra hand at home is so helpful and lets you spend more quality time with your children. Being present just means paying attention. Like a marriage or a friendship, your relationship with your child needs positive attention to thrive. Attention = Love. Like your garden, your car, or your work, what you attend to flourishes. And, of course, that kind of attentiveness takes time. You can multi-task at it while you’re making dinner, but the secret of a great relationship is some focused time every day attending only to that child. Start right for a firm foundation. The closeness of the parent-child connection throughout life results from how much parents and au pairs connect with their babies, right from the beginning. their babies are born have a closer relationship with their child at every stage, including as teens and college students. Is this cause and effect? throughout life. But you don’t have to believe that bonding with a newborn is crucial to note that the kind of man who treasures his newborn and nurtures his new family is likely to continue doing so in ways that bring them closer throughout her childhood. Remember that all relationships take work. Good parent-child connections don’t spring out of nowhere, any more than good marriages do. Biology gives us a headstart — if we weren’t biologically programmed to love our infants the human race would have died out long ago but as kids get older we need to build on that natural bond, or the challenges of modern life can erode it. Luckily, children automatically love their parents. As long as we don’t blow that, we can keep the connection strong. Prioritize time with your child. start baring his soul? Not likely. friends. So as hard as it is with the pressures of a job and daily life, if we want a better relationship with our kids, we have to free up the time or hire an au pair to make that happen. Start with trust, the foundation of every good relationship. Did you know that your intestinal tract is home to billions of different microbes (known as your intestinal microflora) made up of bacteria, yeast, and fungi? Some of these mi-crobes are bad and can cause illness, but some are good. These good microbes, called probi-otics, have a positive and wide-ranging impact on your overall health. We naturally have a mix of both good and bad bacteria in us. When we eat fermented foods, like yogurt or sauerkraut, we ingest more even more probiotic-rich bacteria. Taking probiotics as a supplement, however, is a good idea for most people as the amounts we get from food alone are far lower than therapeutic doses. Even if you think everything feels fine in your gut, remember, probiotics do more than just help keep gas and bloating at bay. When the number of good bacteria in your intestinal tract is outnumbered by the bad you may experience gas, bloating, diarrhea, and even constipation. These symptoms can range from mild to quite severe. While just getting sick can result in decreased numbers of good probiotic bacteria, antibiotic use is one of the primary reasons that good bacteria gets wiped from our system. Antibiotics treat bacterial infections, but they don’t discern between good and bad when doing their job; they just kill off all the bacteria. This is why one of the most common side effects of antibiotic use is stomach and digestive system upset. Taking probiotics a few hours away from antibiotic medication, followed up by intensive supplementation after completing your medication will help recolonize your intestinal tract with probiotic bacteria. Did you know that your intestinal tract is home to billions of different microbes (known as your intestinal microflora) made up of bacteria, yeast, and fungi? Some of these microbes are bad and can cause illness, but some are good. These good microbes, called probiotics, have a positive and wide-ranging impact on your overall health. While many of us try to avoid using antibiotics unnecessarily on our families and our-selves, there’s no doubt that they have their place, and when used properly can help us feel better when we need them. Overuse of antibiotics has created a whole new strain of antibiotic-resistant bacteria called super-bugs. Antibiotic-resistant infections cause thousands of deaths each year. Probiotics have antimicrobial activity, and some experts believe that they could play an increased role in the prevention and treatment of some of these superbug infections. use Triclosan as the active ingredient, which may do more harm than good. create some of these superbugs. the bad bacteria in your intestinal tract. • Eat more garlic as it contains allicin, a phytochemical shown to be effective in fighting colds, flus and other illnesses due to its antibacterial and antiviral properties. • Eating mushrooms like shiitake, cremini and many dried varieties will boost your intake of zinc and selenium, both powerful immune system supporters. Plus, the beta glucans in mushrooms will help regulate white blood cell activity. Nutrients like vitamin C, the B vitamins, vitamin E, and carotenes are also important for a healthy immune system. Choose to eat a variety of whole, unprocessed foods to maximize your intake of the widest range of nutrients possible. A good idea is to ask your au pair to avoid eating lots of sugary snacks in front of the children. • Plain kefir, a yogurt type drink traditionally made with dairy, but now also made with coconut, and even water! If you’re suffering from digestive upset, or trying to replace the good bacteria that has been wiped from your system after taking a round of antibiotics (remember antibiotics wipe out the good and the bad), then the amount of probiotics added to food won’t be enough. Probiotic amounts in supplements are measured in CFUs (colony forming units) and when shopping for a good quality supplement there are a few things to consider in order to get the biggest bang for your buck. Potency - make sure you’re getting a minimum of 100 million CFUs per dose. Storage – most probiotics require refrigeration, although there are some products in “pearl” format that are shelf stable and more suitable for things like travelling. Expiration date – a good manufacturer will guarantee their potency until the product’s expiry date and will list this right on the packaging. Probiotics aren’t cheap, but smart shopping will help you navigate the supplement aisles and choose the best product. There are many different strains of probiotics, known as species. These strains have a variety of therapeutic effects, and some will be more helpful than others when targeting illnesses or symptoms. There are products specifically de-signed for IBS, post-antibiotic use, and bowel disorders. There are also products specifically geared towards children, as children’s intestinal tracts contain different microflora than adults. When choosing probiotic supplements for your family be sure to choose the appropriate products for your needs, and if you’re con-fused work with a knowledgeable practitioner to help you make the best choice. By taking care of your body with whole foods, making positive lifestyle changes, incorporating more fermented foods, and taking additional probiotic supplements you’ll help keep your intestinal tract feeling its best and boost your overall immunity at the same time. If left alone, children will know instinctively what method is best for them. Caring and observant parents soon learn that it is safe and appropriate to trust this knowledge. Such parents say to their baby, “Oh, that’s interesting! You’re learning how to crawl downstairs by facing backwards!” They do not say, “That’s the wrong way.” Perceptive parents and au pairs are aware that there are many different ways to learn something, and they trust their children to know which ways are best for them. When Holt invited toddlers to play his cello, they would eagerly attempt to do so; school-children and adults would invariably decline. Unschooling children, free from the intimidation of public embarrassment and failing marks, retain their openness to new exploration. Children learn by asking questions, not by answering them. Toddlers ask many questions, and so do school children until about grade three. By that time, many of them have learned an unfortunate fact: that in school, it can be more important for self-protection to hide one’s ignorance about a subject than to learn more about it, regardless of one’s curiosity. Let’s play a game. Visualize your childhood playtime routine. Was it filled with running, playing and exploring in your backyard (and all your friends’ yards)? Did you ride your bike through your surrounding neighborhoods and maybe even to school to use the jungle gym ad nauseam? Were your summers permeated with spraying sprinklers, green rubber hoses, worn jump ropes, entire days spent outside, and skinned knees? Did your evenings entail playing ball outside until the street lights came on (at which point you knew you’d better get home and fast)? To many of us, this was a very close facsimile of childhood. “free range parenting” (also called “simplicity” or “slow parenting”). It often involves more unstructured free time, less of a focus on the use of electronic devices, and less hovering of parents around children as they play or make new discoveries. Children are ultimately al-lowed to explore the world at their own pace. It is said that free range parenting is in response to the widespread trend for parents to schedule many activities and classes after school, solve problems for their children, and often “helicopter” around their children to help with any issues that arise. Others contend that this less hands-on, more independence-inducing style is simply a return to the style in which many of us were raised. It is important to note some of the positives of free range parenting. 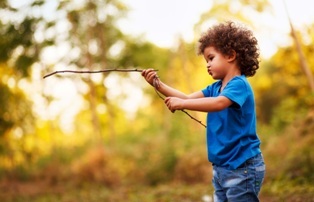 The free range life-style allows children to develop many valuable skills, such as problem-solving, self-confi-dence, and creativity, to say nothing of the value of a well-honed imagination. Children with an active, exploratory life have lower risk of mental health and emotional issues and higher development of motor skills. It is said that the more time kids spend in the great outdoors, as well, lower their chances of developing asthma, allergies, and have a general immunity against many illnesses. They are also far better able to bounce back from the disappointments of life after gaining hands-on troubleshooting experience in their day-to-day activities. But, as with most forms of parenting, opinions differ and controversies arise. With a greater awareness of child abuse and neglect, many are on the lookout for strange or “off ” behavior – such as seeing children out walking or playing without supervision of either a parent or an Au pair. Although each case and scenario is different and unique, many times we see in these news stories that the children ultimately get picked up by police and, due to proper procedure, taken to Child Protective Services before finally allowing the parents to have contact with their “missing” children. There are two schools of thought here. One – those poor parents must have been frantic! Two – the same parents would feel worse if their children had gone missing for real. Both are completely valid points. However, it’s important to note that America, in general, is at its safest point in years. Ac-cording to a recent child mortality report put together by numerous government agencies, childhood mortality has never been lower. In 1935, there were 450 deaths per 100,000 chil-dren aged 1 to 4, compared with today’s number of 30. Some of this can be attributed to a rise in the use of vaccines (do your homework and decide if this is right for you), but the rates have nonetheless continued to drop in recent decades. Homicide rates are at a low of 1.5 per 100,000 children under 14, as well. (although that’s huge). What about an abduc-tion or disappearance? According to the FBI National Crime Information Center, reports of missing juveniles under 18 since 1997 are down 40%. This information also tells of the fact that a vast majority – 96% – of all missing person reports are runaways. A very minute percentage of these cases are what we might consider a “stereotypical kidnapping.” More details can be found through this informative Washington Post article, but the point is, basi-cally, that things are pretty darn safe on aver-age, depending on your particular life situa-tion and neighborhood demographic. As parents, we all know that parenting isn’t “one size fits all.” Every child is unique and every parent and au pair reacts to situations differently. Hopefully, we can all agree that as long as children are in a loving, cared-for scenario – even if it’s completely different than our own – there’s nothing to worry about. It is up to us to use our common sense and intuition to recognize when something is seri-ously wrong, or that we simply need to back off and allow other parents the courtesy to make their own choices for their families. 25 tips to make your house a happy and healthy safe haven. When you’ve got a young child, you’ve got a little adventurer on your hands, always keen to examine every nook and cranny, and to touch and taste everything he can get his hand on! But while this eagerness to explore can be great for his learning and development, it can also get him into some sticky s ituations. According to the Royal Children’s Hospital Melbourne, little ones from birth to fourth years account for over half hospital patients treated for accidents in the home. Burns, bumps and falls, poisoning, chocking and near-drowning are among the top type of accidents kids can encounter – but thankfully there’s a lot that you can do to prevent them. 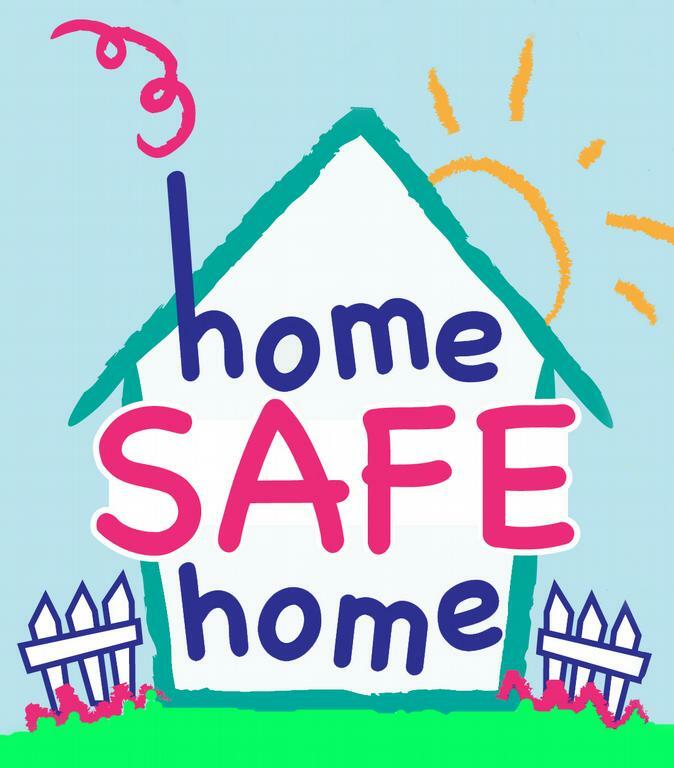 The first step when it comes to making your home kid-safe? “Get down on your hands and knees and pretend to be a child to see what kinds of mischief you might get into”, advises Christine, executive officer of Kidsafe NSW. “Until you’re down thee you don’t notice the power points, the sharp corners, the cupboard doors or the dangling vertical-blind cords”. 1. Be food safe. The re are 5.4 million cases of food-borne illness in Australia each year, and kids are particularly vulnerable. The bacteria that cause food poisoning like to grow between 5° and 60°C, so keep hot food piping hot and store cold food at 4°C or below. Keep ready-to-eat and raw food separate during preparation and storage, wash hand before and after handling food, pay attention to use-by dates and be sure to cook meats thoroughly. 2. Keep it clean. If you have an au pair tell her to wipe down all kitchen surfaces as you go, particularly where raw foods have been prepared, to help limit of spread of bacteria. It’s best to have one sponge or cloth for surfaces and another for dishes and to change these regularly. Pop them, wet, in the microwave for a couple of minutes to help zap the bugs. 3. Put things on the back burner. “Since there are so many hot things in the kitchen, it can be a pretty dangerous place”, Christine notes. To prevent accidents, put pots and pans on the back burner or turn the handless away to stop your little one reaching for them. “Children around nine to 15 months ae starting to pull themselves up and may grab for these. They might also use the hot oven door”, Christine says, adding that stove guards can be a good investment for this reason. 4. Look it up. 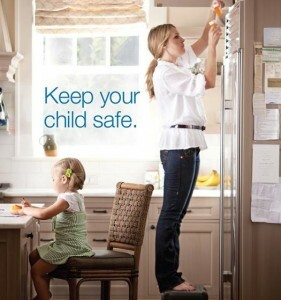 Installing childproof locks, latches or brands on cupboards and drawers in the kitchen, is an important safety measure. This can stop your child from using drawers to climb to dangerous heights, from getting his hands on sharp utensils and household chemicals such as detergents, and helps keep other items, such as plastic bags, out of harm’s way. 5. Bring out the barriers. “If you can, keep your child out of the kitchen all together with a gate or barrier”, Christine advises. If you need to spend time in the kitchen, keep him quietly occupied with crafts in your line of sight, or find something for him to do in another area of the house that’s close by. 6. Bet on barriers. “It’s important to use a barrier or gate to prevent younger children from going up and down any stairs,” Christine says, as topples and tumbles are very real risks. ”When it comes to the balustrades, make sure your child can’t get stuck between the rails, can’t climb on them or slip under through them”, she adds. 7. Be on dirt alert. When you have time to get on top of household chores, try to vacuum carpets and wash floorboards, as little kid get really up close and personal with these surfaces! Watch your use of harsh cleaning agents that might leave chemical residues, and think about a “no shoes” policy for your house – it’s a great way to keep (or at least limit) dirt, muck and pollutants from getting in. 8. Show socket safety. All unused power point and strips should be blocked with power-point covers, Christine advises, which will stop you littlie from poking thing into them. Having safety switches installed that switch the power off if there is a fault can also help prevent electrical shocks. 9. Go on lockdown. Climbing and clambering kids get hurt from toppling furniture or other items, says Christine. Make sure furniture is sturdy and not-top-heavy to limit the chances of toppling, and secure items to the wall with ‘L’ brackets where you can. Also watch heavy objects on top of furniture that could easily fall onto your child – secure the TV with a strap, keep big or breakable objects in cabinets and try to avoid decorative tablecloths or other dangling items that could be pulled on to send items falling. 10. Be (smoke) alarmed. Smoke alarms are an important measure in keeping the whole family safe. Have them installed on every level of your home, particularly near the bedrooms, and be sure to test them regularly and change the batteries often. 11. Change the bed. 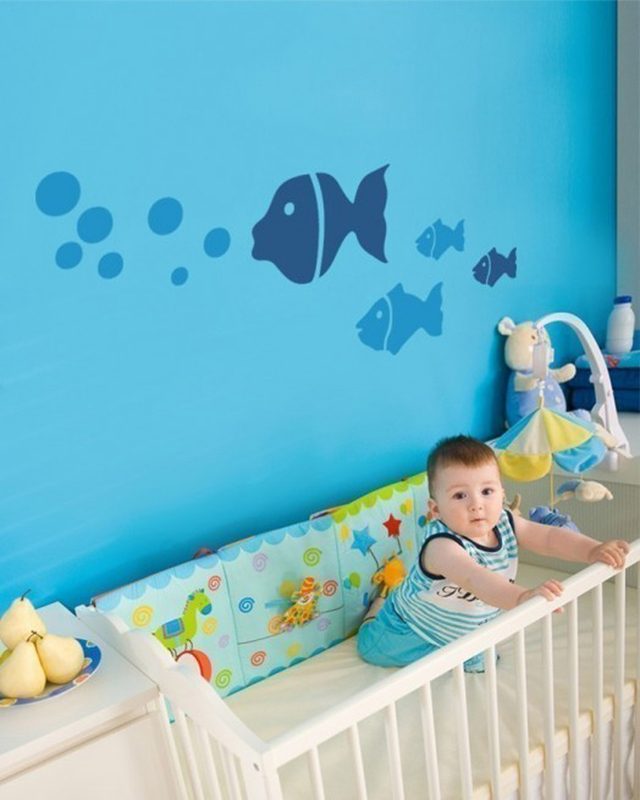 If y our toddler is still in his cot, he may develop a habit of climbing up and over the cot rails when he wants to get out, which can lead to falls. While there’s no set age for making the transition from cot to big bed, most kids are ready around the age of two. It’s a good idea to choose a bed with small side rails to stop him from rolling out of it. 12. Careful of cords! As the Child Safety Handbook published by the Royal Children’s Hospital Melbourne notes, dangling curtain cords, phone cords and straps, ties and strings on clothes and toys can pose a strangulation risk. When it comes to window cords, these should be kept shorter than 30 cm and well off the floor. If you can’t cut or exchange window cords for rods, secure them with a cord clips or wrap them around a cleat, and keep your child’s cot or bed well away from them. 13. Have high standards. Particularly if you’re getting it second-hand from eBay, friends or the op-shop, make sure all furniture meets current Australian Safety Standards. You can download a great ACCC booklet from www.accc.gov.au/content/itemld/993087 for all the need-to-know details. 14. Watch windows. “Children can fall out of a window which is open more than 10 cm, even if a fly screen is present”, the Children’s Hospital at Westmead warns. As part of its “Kids Can’t Fly” campaign, the hospital recommends all windows have locks fitted to stop them being opened more than 10 cm, or have window guards installed. Also watch where you position cots, beds and objects kids can clamber on top of in relation to windows. 15. Play safely. When it comes to storing toys, your littlie’s toy chest should have lid support so it doesn’t slam shut on his tiny fingers and ventilation holes should be climb on in a find himself stuck. The toys themselves should have no small, sharp or breakable parts. Follow the age recommendations and check regularly for wear and tear. 16. Simmer down. The Child Safety Handbook notes that “the best way of preventing scalds in the bathroom is to reduce the temperature of the hot tap water at the basin, bath and shower to 50°C”. Tap covers that stop tots from turning taps on and off are another good idea. Make sure that your au pair is careful when she puts the kids in the shower. 17. Be mindful with medicines. Keep medicines in a child-proof box in a cabinet at least 1.5m off the ground so they’re out of reach and out of sight of curious hands and mouths. While you’re at it, lock away mouthwash, nail polish remover, hair dye and the like, along with sharp objects such as nail scissors and razor blades. 18. Wash well! Hand-washing is so important! Little kids often fall sick when faecal bacteria end up in their mouths, so teach your littlie how to wash his hands well after using the toilet, touching pets and being out and about. Hands should always be scrubbed well before eating, too. 20. Be on water watch. Supervision in the bath is paramount. Ignore phone calls and stuff going on in other rooms of the house when your tyke is in the tub – she should never be left unattended. Toilet water can also prove problematic, so keep the lid closed and consider a child-proof latch. 21. Put it away! The Royal Children’s Hospital Melbourne reports that a third of home injuries to children under five years occur in the garden or garage. A good first step in preventing accidents is to securely lock away tools, ladders, gardening instruments and other such gear so that your child can’t get to them. 22. Be sensible with poisons. As well as storing these correctly (in their original containers, well away from your child’s sight and reach), use them wisely. Snail pellets shouldn’t be used in the garden, for example, as your child or pet might mistake them for a snack. And if you’ve had to use any pesticides, herbicides or other chemicals, don’t let your littlie out there to roll in them. 23. Weed out nasty plants. Some plants are poisonous if eaten or prone to causing irritation when touched, so be careful what you let grow. “On our Kidsafe website, www.kidsafensw.org, we have information about what plants to avoid and your local council will also have this information”, says Christine. 24. Avoid driveway accidents. It’s a scary statistic – according to Kidsafe, one child is run over in the driveway of their home each week in Australia. Always have someone (like an au pair) holding your child’s hand or holding close when the car is being moved in or out of the driveway. It’s also wise to discourage playing near the driveway and to make access to it difficult with fencing or gates. 25. Be water wise. All pools and spas should be surrounded by a well-maintained fence with a self-locking gate, and even inflatable pools that exceed 30cm need a barrier around them, too. It’s best to empty, deflate and store these safely when not in use to prevent water puddling in them, Christine reminds. “Also be careful of pet bowls, bucket and other containers that may be able to fill with water when it rains. Little children are very top heavy and can drown in very small amount of water”. Too often parents and Au pairs take responsibility for their kids’ screen-free time by structuring activities for them. They think that if kids are upset or bored without electronic entertainment, they must provide another activity for them to do. But this is just another form of rescuing. 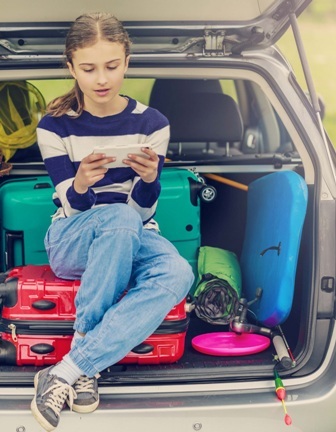 When parents are quick to step in with activities to distract kids from boredom or anger about not having their screens, they inadvertently rob children of the opportunity to develop problem solving skills and resilience. have faith in your children to handle their feelings, they will learn to have faith in themselves, too. It is important that parents do not make children suffer, but sometimes it is most helpful to “allow” them to suffer with support. Parents and Au pairs in Australia too often (in the name of love) want to protect their children from struggle. They don’t realize that their children need to struggle, to deal with disappointment, and to solve their own problems so they can develop their emotional muscles and the skills necessary for the even bigger struggles they will encounter throughout their lives. 3. Do not rescue. It’s OK to feel upset. 4. Let them know you have faith in them to figure out what to do. time when there are no screens to watch. The support parents and Au pairs can offer is to validate her feelings, but avoid solving the ultimate problem of what to do instead. Say, “I can see this is very upsetting to you. It can be disappointing when we don’t get what we want.” Period. Some parents overdo validating feelings; they go on and on with the hope that validating feelings will take away the suffering. the tough part— no rescuing and no lectures. can do with herself. Children will learn to get past the disappointment of reduced screen time, and they will be able to develop their imagination and creativity in solving the problem of, “What should I do?” Parents and Au pairs just need to provide an atmosphere of loving support that does not include “bawling them out” (lecturing on how many other toys, games, crafts, and activities there are available to do), and “bailing them out” (fixing their boredom by providing a new activity). Have faith in your children; they will grow stronger for it. • “No TV until after homework is done. I will be in the kitchen making dinner. ultimately turning the decision over to the child.